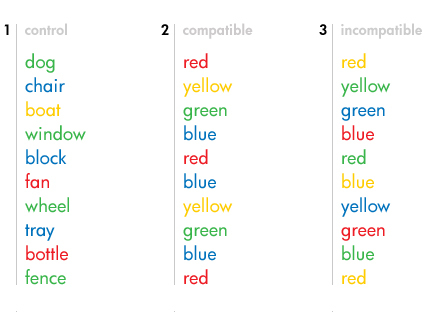 What is The Stroop Effect? 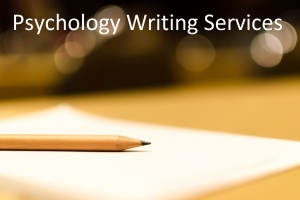 - Definition | What is Psychology? Task: Do not read the words above. Instead, say the COLOR of each word in each column, in a loud voice as fast as you can. The results of the tests showed that most persons tend to say the color of each word for columns 1 and 2 with little problem. Despite the clear instructions however, most persons struggle to say the color of each word in column 3. This difficulty occurs due to semantic interference. When we look at the words in the test, we process the color of each word as well as the meaning of each word. If both stimuli (color and meaning) are congruent or compatible, we will respond with the correct answer rapidly. This accounts for most persons having the fastest reaction times for words in column 2. If there is a direct conflict between word color and word meaning then the stimuli are incongruent or incompatible. In such a case we will have to make a decision and pay more attention to one stimulus than the other. Experience has taught us to attach more significance to the meaning of words rather than the colors they are written in. Reading is automatic for most people. Therefore when we are instructed to do the opposite and pay more attention to the color of the word, interference occurs. We have to consciously adjust our answers as this new task is not as familiar to us as reading is. This results in our reaction times being much slower with column 3 than with the other columns. This helped out a lot!